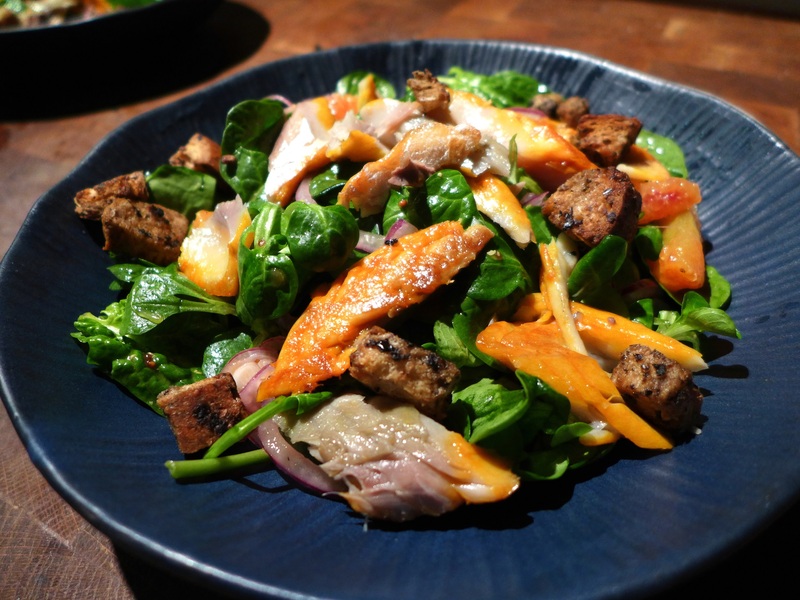 This is one of the quickest, lightest and freshest suppers going … get it while you can because blood oranges have such a short season. If you can’t source them, substitute ordinary oranges or maybe add in some pink grapefruit. I used cold smoked mackerel here, but you can use hot smoked instead. The latter will already be cooked, of course, but it’ll be all the better in this salad if you give it a few minutes in a hot pan to heat it through. Pre-heat the oven to 190C/375F/Gas Mark 5. In a small bowl, mix the oil into the tapenade and add the bread, stirring to coat thoroughly. Set aside for the flavours to soak in. Slice the onion and place in a bowl. 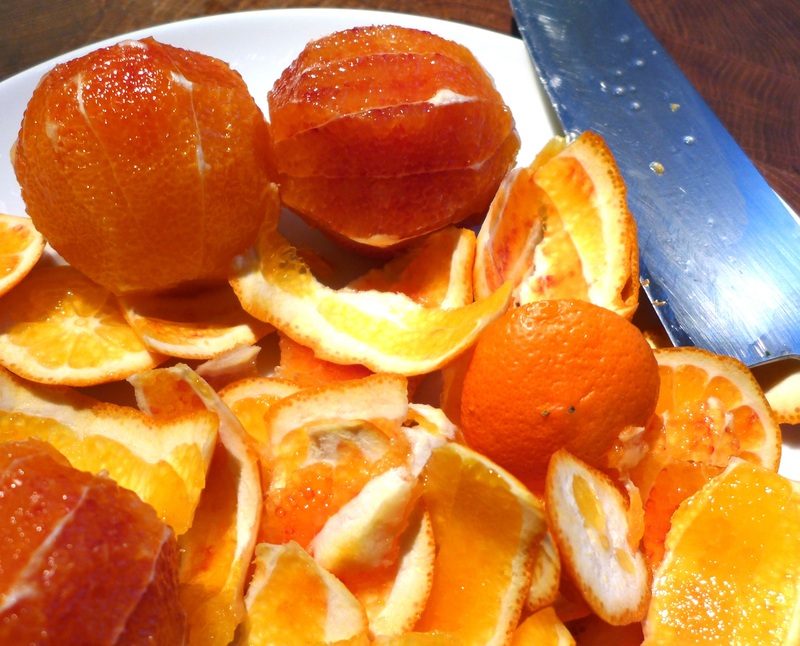 Cut a slice off the top and bottom of each orange so they sit comfortably, put them on a plate to catch the juices, then, cutting downwards with a sharp knife, slice off the peel and pith. Cut out the orange segments, leaving the membrane behind. Put the segments in another small bowl and cover and set aside. Squeeze the juice from the debris. Pour it over the sliced onion, mix well, and leave to sit for an hour or two or as long as you have time for: this will take some of the harshness away. Cook the croutons in the pre-heated oven for 5 minutes, turn, then cook for a further 5 minutes or until golden. Watch them, they burn easily. Remove and set aside. Make the vinaigrette, mixing the first three ingredients in a lidded jar, then adding an equal depth of olive oil. Put the lid on and give it a good shake. Warm a frying pan on a medium heat. Put in the mackerel fillets, skin-side down, and cook for three or four minutes. Flip over and cook for a minute or two more. Remove from the pan and peel off the skin. Put a tablespoon of the vinaigrette in a salad bowl, add the leaves and mix well to coat. Add the orange segments and onion and mix again. Divide the mixture between two servings plates, flake over the mackerel in large chunks, toss briefly, then scatter with the croutons and serve. 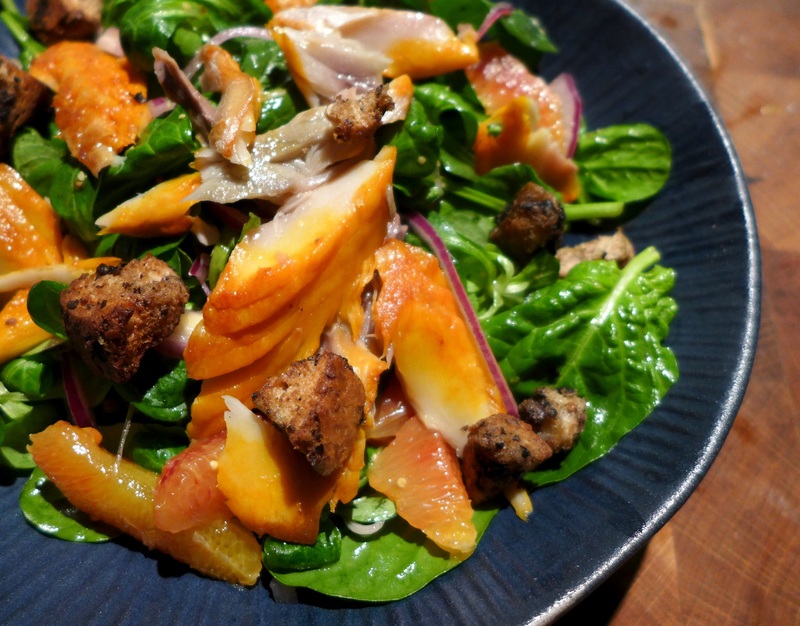 This entry was posted in Fish and shellfish, Mains and tagged quick suppers, smoked mackerel and blood orange salad, smoked mackerel with blood oranges by Linda Duffin. Bookmark the permalink. Oooh, I’m in. That sounds delicious. I am always kind of skeptical mixing fruit to my “salted” meal, but this recipe definitely has captured my attention! I love the idea of the taste, and the colorful effect on the plate! I love adding fruit to salads:the combination sweet/savoury is pretty unbeatable for me: pears/apples and cheese, persimon fruits and feta, oranges and fishly flavours. Oh, absolute ‘yum’ if I may put it childishly! Now to find out when the blood orange season is in my part of Australia ’cause I know it to be brief. Have to wait a few months methinks. This is such an inviting way to serve the fish that I’ll even make the croutons I can see adding to mouth feel and taste . . . usually the ‘h’ word keeping me restrained 🙂 ! Fruit and proteins . . . . too many examples of dishes we all make and love . . . Thanks, Eha, hope you enjoy it if you get to make it.